Submitted photo Juliana Erwin is joining three Greene County Ohio State University Extension office staff this summer. 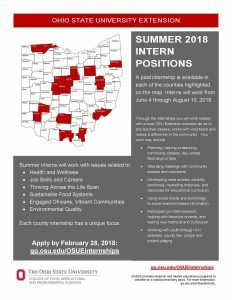 XENIA — OSU Extension Greene County was selected to have one of 12 paid intern for the summer from June 4 to Aug. 10. Juliana Erwin was a 11-year member of 4-H in Clark County. Erwin showed hogs and a dairy feeder in FFA. She is attending The Ohio State University studying community leadership extension education. She will be a senior for the 2018-2019 school year and will graduate in August 2019. Erwin lives in Springfield. This summer she will be working with all of the staff at the OSU Extension Office. Some tasks include planning, helping or teaching community classes, day camps, field days or fairs. In addition, she will be attending meetings with community leaders and volunteers. Erwin will also develop materials and brochures specific to the county needs. She will also work with youth through a variety of 4-H activities including the Greene County Fair, Cloverbud Camp, Overnight Camp, and judging day. For more information on OSU Extension Greene County visit www.greene.osu.edu. Greene County will be hosting an intern for this upcoming summer. Whether you are passionate about food issues, agriculture, helping youth, the environment, or healthy people and communities, there is an internship opportunity for you! 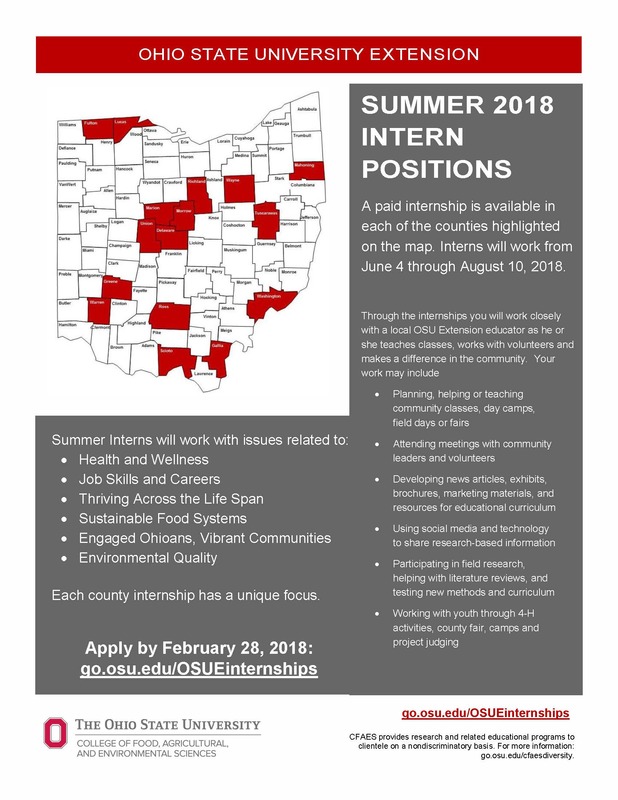 Interns can apply to work in one of 13 locations throughout Ohio. To be considered for one of these 12 paid internships, you must complete two years of college by June 1, 2018. Review the chart below to determine the internship in which you may be interested. You may apply for multiple positions with one application. By February 28, 2018 (11:59 pm), submit the following information. All interns work 38 hours per week and will be paid $11 per hour. Interns who are earning college credit during this period will work 28 hours per week. Interns will work closely with the OSU Extension educators in the county. This will include educators in agriculture and natural resources; family and consumer sciences; 4-H youth development; and community development. Successful candidates will be notified the week of March 25, 2018. Each internship focuses on a different area impacting local residents. Below are listed the counties where each internship will be located and the impact area(s) on which the position will focus.